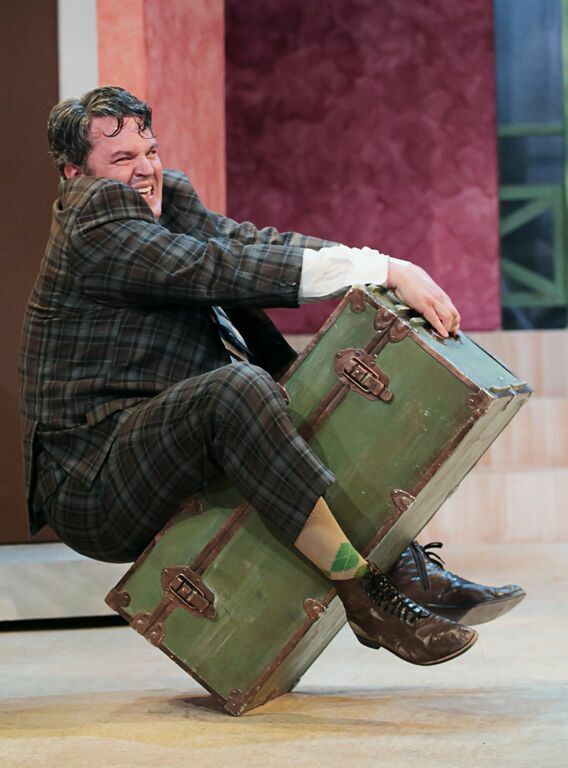 Matthew Lewis Johnson as Francis Henshall in Cincinnati Shakespeare Company’s Regional Premiere production of “One Man, Two Guvnors” based on “The Servant of Two Masters” by Carlo Goldoni, directed by Brian Isaac Phillips playing June 12- July 5, 2015. Performances are located at CSC’s Theatre, 719 Race Street in downtown Cincinnati. Tickets are $14-$35 and are available now online at cincyshakes.com or by calling the box office 513.381.2273. By Mikki Schaffner Photography. Cincinnati Shakespeare Company doesn’t need me to tell you to go see ONE MAN, TWO GUVNORS, running through July 5th at their downtown theatre. It sold out almost before it opened (they have added two Saturday matinee performances so if you would like to see it, that’s your best shot). This theatre machine cranks out box office hit after hit, appealing to a very loyal base audience. They have a formula that works and is allowing them to eventually move to a new space in “theatre row” in Over-the-Rhine (they’ll be within blocks of Ensemble Theatre and Know Theatre of Cincinnati in their new home). Perhaps I was too close to the action this time. I normally love sitting towards the front, but I found myself distracted by the fear of being called onto the stage by “Francis,” (the larger than life comedic character played by Matthew Lewis Johnson). I couldn’t understand most of the dialogue in the first scene. And I grew tired of the long scene changes, despite enjoying the musical stylings of Cary Davenport, Jeremy Dubin, Kelly Mengelkoch, Josh Katawick, and Lindsey Agusta Mercer. Act One ran nearly ninety-minutes, if you count the concert by “The Shakes” that put the start time well past 2pm. With an advertised fifty-two minute second act, I simply couldn’t stay as I had an unexpected day-job issue arise that couldn’t wait. By the way, I have heard that it causes quite a ruckus when this “critic” leaves at Intermission; frankly it doesn’t mean the show is bad, necessarily, and I don’t ever review parts of a show I’ve not seen. I would ask that you see this blog as the free marketing and publicity that it is intended to be and don’t be so concerned about what *I* think about the show itself. My solitary, singular, and personal opinion is really inconsequential (or should be) to the artistic “success” of your production. There were lots of things to like about this; Johnson is fully committed to the role of the doofus man-child. Part Chris Farley, part John Belushi, part Mr. Bean, Johnson is all-in. Jeremy Dubin as an 80-year-old man is charmingly funny, as you would expect. Justin McCombs gets to mug in a way that caused audiences to fall in love with him long ago. Caitlin McWethy once again shows her diverse and multi-faceted talent. And the Act One finale is riotous and unexpected. I just wish it didn’t take so long to get there. ONE MAN, TWO GUVNORS is certainly a fun theatrical experience and if you are a fan of slapstick and/or British humor, then this is the show for you. It’s certainly not the worst way to spend your entertainment dollars. ONE MAN, TWO GUVNORS runs through July 5th at Cincinnati Shakespeare Company on Race Street. Call 381-BARD or click here for more information on tickets and their 2015-2016 season.